The right mindset is crucial for any career. It’s what will propel you to keep on going even when things are difficult, or situations are simply not to your liking. With the right mindset, your ability to overcome automatically intensifies, securing your professional future. 1. It will teach you how to market yourself and your skills, making you highly employable. Any job can be the launching pad for a career. Presenting yourself well to any business organization is a must. “Sell” or establish yourself as an asset through your personality, the way of thinking and skills and you can secure that job and get your career going. 2. The sales mindset is focused on providing great service. This wins you points with clients. Here’s the quirk of a solid sales mindset: It’s not the top priority. The top priority is to deliver great service. If you cultivate such a mindset, you’ll be more intent on delivering a client’s requirements in any way you can. You get to demonstrate that while the business matters, your end users matter more. This behavior never fails to leave a good impression on clients, encouraging more engagement with the business through you. 3. It addresses clients’ needs, creating more business opportunities. Directing attention toward the actual needs of the company’s end users will allow you to come up with career growth opportunities. Say, your retail store offers products that are specifically designed for the elderly. Think about the reasons that prevent them from frequently buying. Perhaps they find it physically strenuous to go to your store, or they’re often not up to the task of shopping. Generate business ideas that address these issues and expand your company’s operations. You can likewise help increase its income, and this will allow you to utilize more of your skills and secure your career. 4. It will hone you into an industry expert, helping you gain respect and trust. The sales mindset will drive you to know your products, services, other offerings, and the industry inside out. You will not only be able to provide the answers clients need, but you will also gain their trust and loyalty. In any career, securing other people’s trust is always a huge advantage because they will keep on turning to you even in the presence of worthy competitors – you are the authority for them. 5. It will teach you the value of all connections, thus growing your professional network. When you’re building a career, one of the most crucial things to do is to create a network of people that can help you grow. With a sales mindset, you’ll come to appreciate and value all kinds of connections – even unpleasant ones. Rude customers are among the best sources of success lessons. You’re a bigger winner if you don’t let their behavior alter your personal brand of service. Moreover, if you win a rude customer over, you earn a connection that will benefit you in a variety of ways in your career. 6. It will train you to thrive on challenges, so you’ll learn what you’re made of. 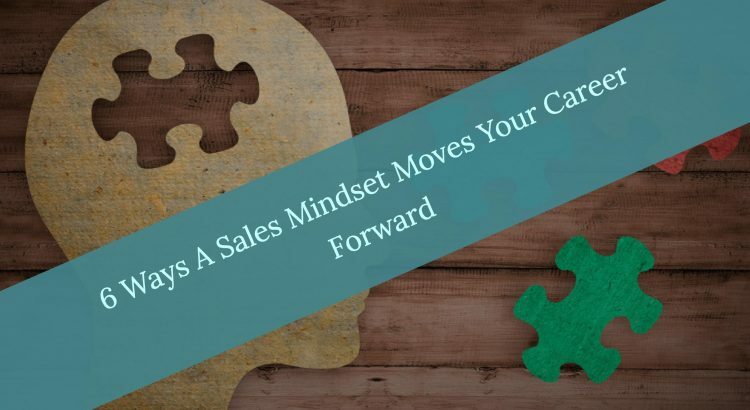 One of the key advantages of the sales mindset is that it directs focus on issues or problems, and so the mind becomes constantly active in order to determine the best solutions. If you’re a strong problem-solver, you automatically establish yourself as an important member of your organization. Your superiors will take note of that and deem you perfect for much tougher responsibilities that will mold you beautifully for your career. As you hustle through the difficult challenges successfully, you’ll continue to grow and really see the good that you are made of. After all, those who risk going farther are the ones who actually learn how far they can actually go.